A complete custom design on the balls, sleeves, and outer box, using your corporate image! Pricing is per dozen balls. Minimum order 48 dozen with custom design. Your imprint is on the Outer Package, Sleeves, and Balls! This custom packaging adds additional class to this Titleist(R) Pro V1(R) dozen. 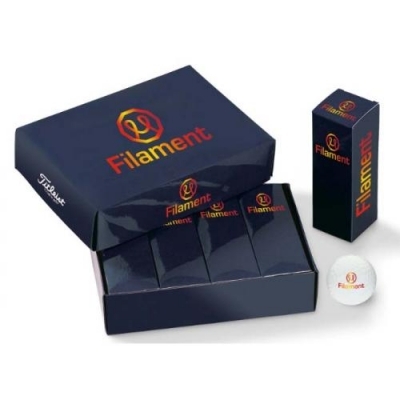 Price Includes: 1 to 4-color PMS matched logo on balls and 4-color process on outer package and sleeves. Product Size: 7-1/2"w x 5-1/2"h x 1-3/4"d.
Pad Print: Equator of a Golf Ball, 7/8" dia., 5 color(s) max. A no-charge mandatory email proof is required. Spec Samples/Product Proofs not available. Less than Minimum not available on this item. Packaging: Boxed, 24 per case, 37 lbs. per case.